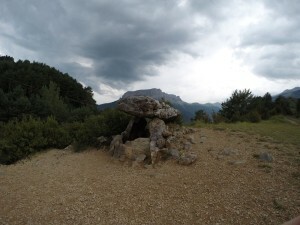 In August 2014, during the 7 months I lived in Catalunya, I organised a Modern Explorers road trip spending 10 days driving through the Pyrennes visiting and filming as many megaliths as possible. 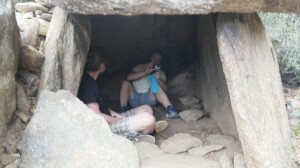 Two friends from Norway, Oddfrid and Robert, flew in to meet me in Calella de Palafrugell and after a few days visiting some local dolmen and some cart ruts I discovered we borrowed the work van and set off on a mini adventure. 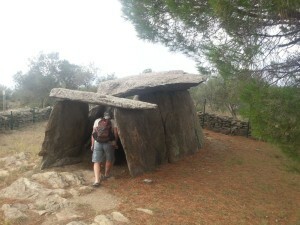 Our first stop was the Cap de Creus national park to visit a standing stone and a dolmen in the hills close to the town of Roses. 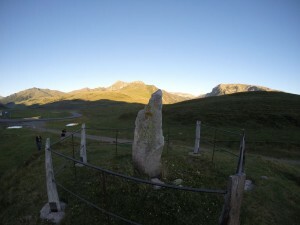 I wanted to video the introduction to the film at a standing stone called Casa Cremada which has a beautiful line of quartz crystal running through it. 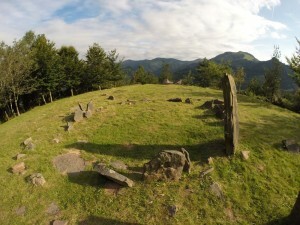 This is a significant characteristic of the megalithic monuments around the world as they are usually made from rock with a high percentage of quartz possibly due to the piezo electric effect and energy producing potential. 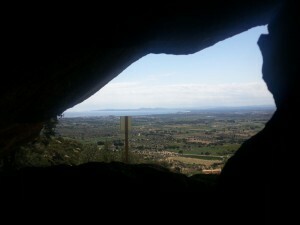 From the Casa Cremada we spent about 15 minutes walking down to a huge dolmen, passing a number of different standing stones along the way. 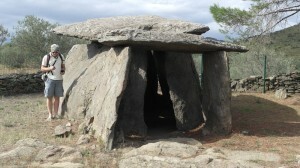 The Creu d’en Cobertella dolmen is one of the largest I have seen made from 12-15 megalithic rocks, a couple of which must have weighed in the region of 8 or 9 tonnes. 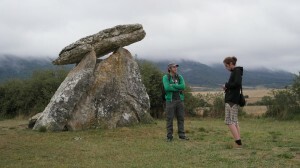 It also had a couple of cup marks which is an uncommon feature in dolmen but found at various other sites across the planet. 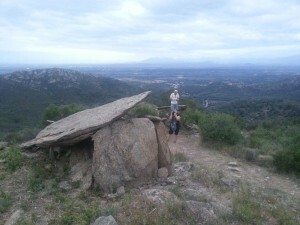 From the Creu d’en Cobertella dolmen we drove to another ruta megalitica in the Cap de Creus park to begin a hiking trail leading through a valley scattered with stone tables of varying sizes. 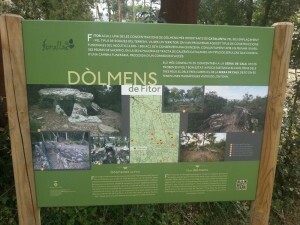 This area is a hotspot of megalithic monuments, with lots of signs giving you the names of the dolmen and some information about them. 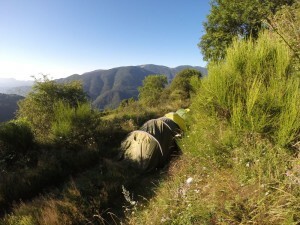 In the evening we visited the Garrollara, Vinya del Rei, Talaia and Ruines dolmen but it soon became dark so we ended up camping on a river bed in the valley so we could visit some of the others in the morning. 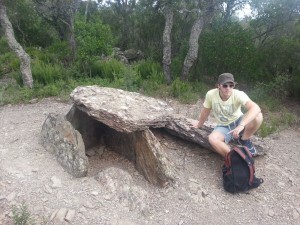 In the morning we visited another couple of dolmen in pretty bad condition, Vinyes Mortes 1 and Vinyes Mortes 2, we then drove to another area about 10 miles away with a number of dolmen built on the side of a hill. 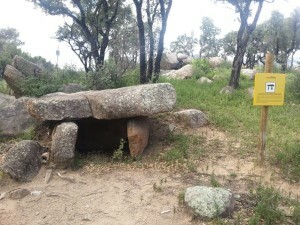 We visited a couple of them, La Devesa and Dolmen de Mas Bofill, their shape was pretty different as the builders used different sized stones to deal with the gradient of the slope. 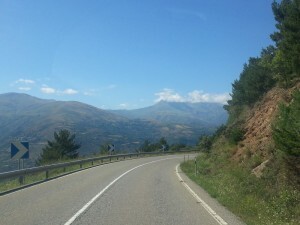 After lunch we started driving towards the mountains stopping to visit a small dolmen and standing stone hiding in the woods – Dolmen and Menhir de Querafumat, then we continued ascending up into the mountains to find somewhere scenic to camp. 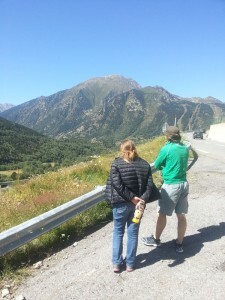 We spent a day driving through the mountains, passing one ski resort after another. 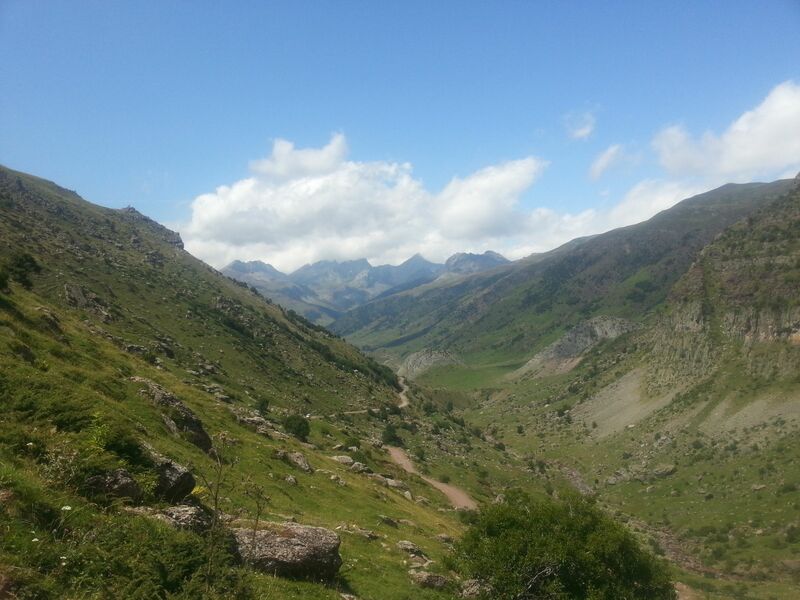 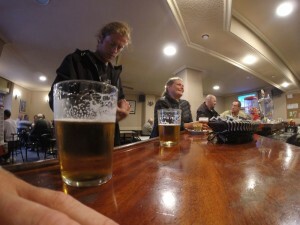 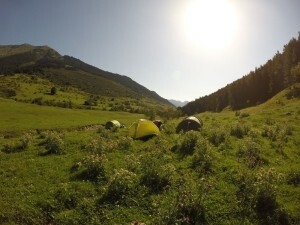 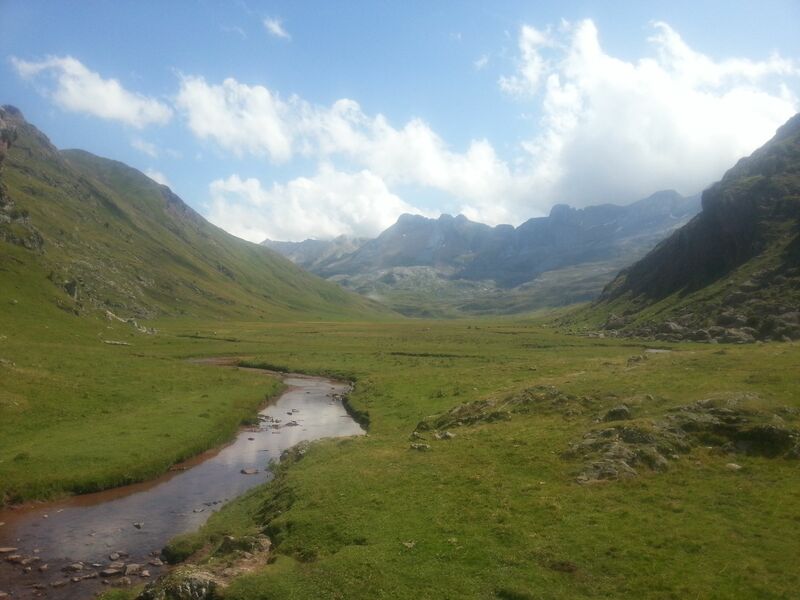 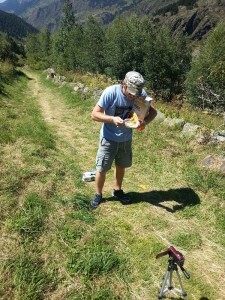 We stopped in Andorra so I could eat Corn Flakes in my 71st country then we continued on through the mountains to get to our next site in time to set up camp in the dark. Due to driving a few hours in the dark we didn’t really know where we were in the morning, deep in the Pyrenees somewhere but exactly where was unclear. 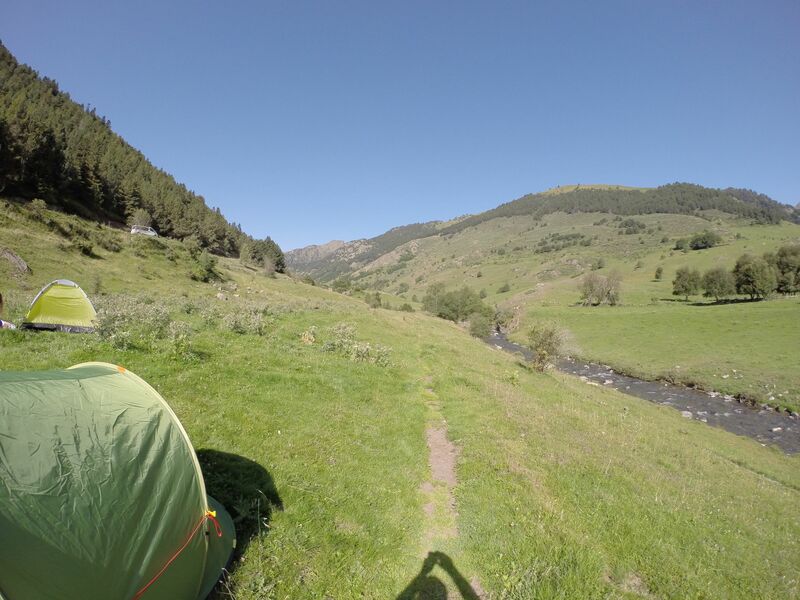 We ended up camping right next to a river in Pla de Beret with some unexpected little stone circles on the other side of the water. 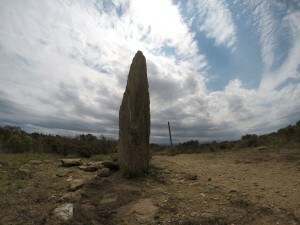 The area has many megaliths, mounds and stone circles as well as a long history of witchery, we filmed a couple of standing stones next to the road (Peira Roja and Peira deth Uelh) then continued heading west. 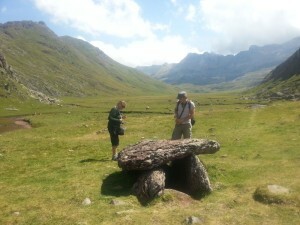 We stopped briefly at an isolated little dolmen (Dolmen de la Tella) surrounded by some stunning scenery then drove deep into the Pyrenees about 60km east of Pamplona. 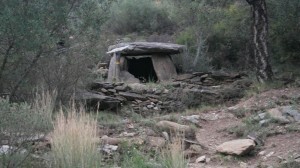 We went on the hunt for a hard to reach and hard to find dolmen whose photos had intrigued me when I was researching the trip. 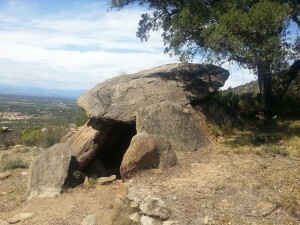 The Aguas Tuertas Dolmen was right on the border with France and was made from a rather unusual rock, almost like a conglomerate of different stones that looked like a kind of concrete, something I hadn’t seen before on any other megaliths. 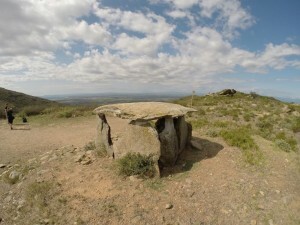 A little bit further down the hill was El Salto Dolmen, which looks like it’s just a stone mound but there are some megalithic stones buried in the middle and it’s classed as a dolmen. 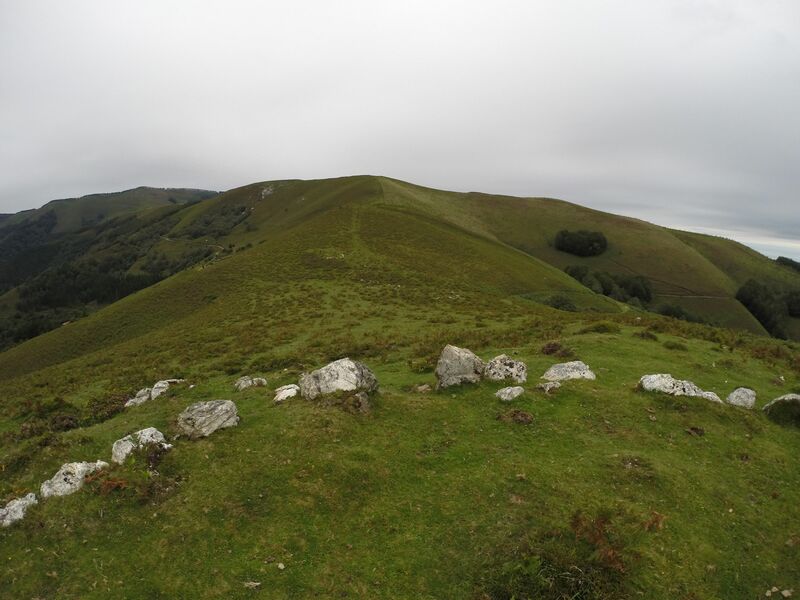 The scenery was fantastic so we took our time meandering through the valley looking at all rocks that were probably the remains of dolmen and standing stones but we didn’t film them as it would have taken a couple of days to explore them further. 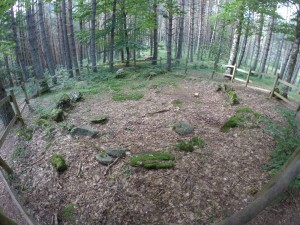 We finished the day lower down in the valley visiting some stone circles in the woodland that were made from small rocks and hidden in the vegetation. 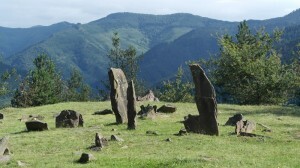 We were almost at the other side of the Pyrennes where there are large numbers of stone circles, generally found in clusters of 5 – 20 and mostly built from smaller stones so not really megalithic. 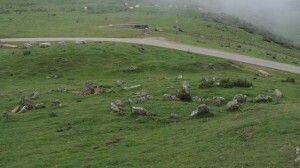 First we visited a group of at least 15 circles (Azpegiko Lepoa Cromlechs) that were hiding in the clouds when we arrived but luckily it cleared up enough to allow us to film and I was glad it did as you could see there were many more structures in the area hiding under the top soil. 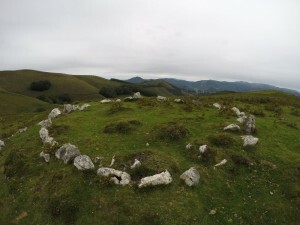 The circles in this part of the world are like mini versions of those found in the U.K, both the size of the stones and the diameter of them, most of which were 5 – 10 metres across. 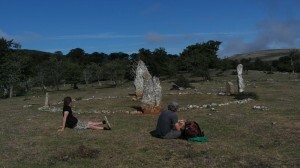 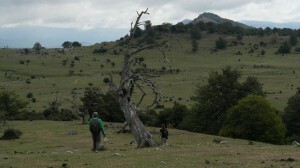 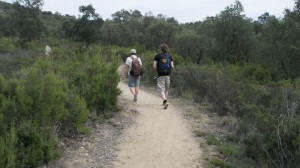 We continued to the valley of Baztan, another area decorated with Megaliths. 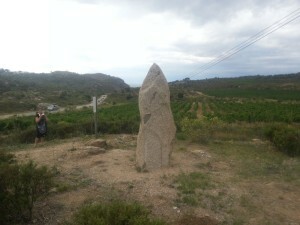 We visited the Elizondo museum with a standing stone on display and a great map showing all the ancient rocks in the area. 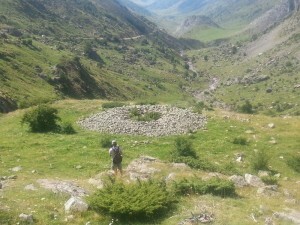 We spent a day trying to find some of the more photogenic ruins but didn’t have much luck as they were pretty hard to find, but the next day we hit the jackpot and found one of the exceptions to the rule in Mulisko Gaina, which is a cluster of circles and dolmen which are built from megalithic rocks. 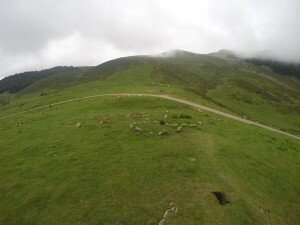 The site was pretty amazing – the views were stunning and there were wild horses roaming the hills, the circles were made from jagged stones which really added to the atmosphere and the dolmen were again made from a kind of conglomerate of smaller stones, as we saw at the Aguas Tuertas Dolmen. 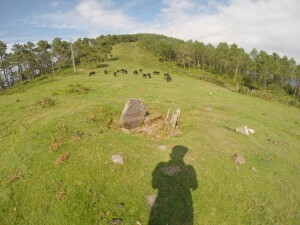 We wanted to film another collection of stone circles so we climbed up another of the hills in the area to visit the Errekaleku Cromlechs. 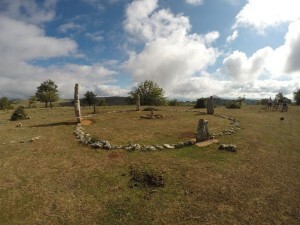 There was a collection of about 20 stone circles and I made the point on film that the circles didn’t seem to repeat their size or the patterns on the ground and that maybe there was a link to the work that Michael Tellinger was doing in South Africa. 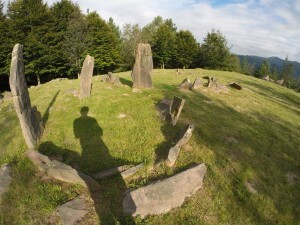 He has found hundreds of thousands of stone circles that form some amazing shapes when seen from the air, some of which match Hindi symbols and other fascinating shapes. He hypothesises that the patterns are laid out to match the sound frequencies being emitted by the earth so they form sacred geometric patterns or cymatics that allow the circles in utilize this form of energy. 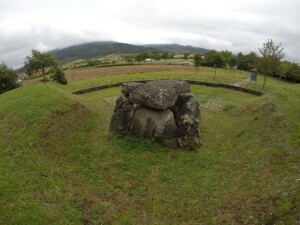 We were running out of time so we left the area covered in megaliths and headed South to visit a few more sites before our trip ended. 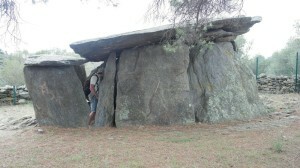 We stopped off at a couple of large dolmen (Aizkomendi and Sorginetxe) then continued on to our last site, the Mendiluze Cromlech where I wanted to conclude the film. 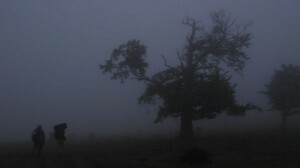 We arrived as it was getting dark and found ourselves in the mountains surrounded by a thick fog, this made finding the circle an almost impossible task but we hiked off in the general direction hoping we would bump into it. 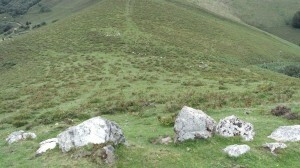 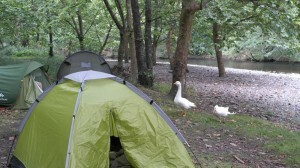 We didn’t and got completely lost instead so ended up setting up camp with the intention of finding it in the morning. 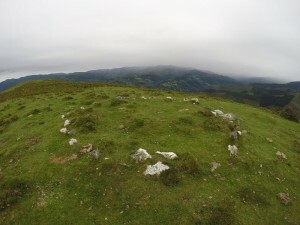 Luckily there were dog walkers in the morning so they were able to point us in the right direction and we eventually found the strange circle with 4 megalithic stones and some smaller rocks used to create a circle. 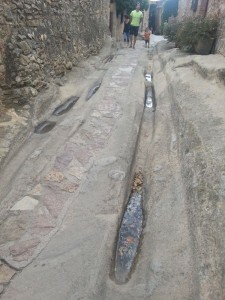 It was a great example of how these ancient sites have been altered and adapted by various generations over the years and I made this point on film as well as summing up our trip. 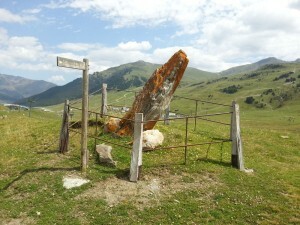 We managed to visit all of the sites I had planned to visit so our trip was over. 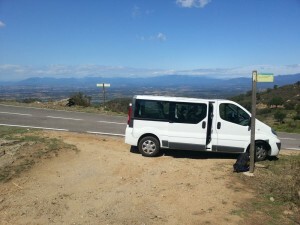 We drove back to Catalunya and the Norwegians flew home leaving me to carrying on working for a few more months before flying to South Africa.